Perhaps best known as the youngest ever player to win the English Amateur Championship, back in 2003, Alex Davies from Holland-on-Sea first qualified for the main tour in 2007/8. It was to prove a tough début campaign for Alex though as he won only six matches, finishing 88th in the rankings and being immediately be relegated from the circuit. 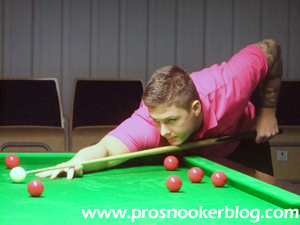 Having entered a number of PTC events, Alex failed to regain a place on the main tour via the PIOS and subsequently the Q School in both 2012 and 2013, but was to make it back at the third attempt in 2013. 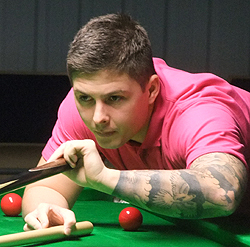 There he defeated Sean Halligan, Michael Collumb, Duane Jones, David Morris and Mitchell Travis to earn a two-year tour card from the first event. Alex resumed his professional career in style, as he defeated Shaun Murphy in the opening round of the Wuxi Classic, to earn a place at the venue stages of a full-ranking event. Though he was unable to progress further than the last 64 at the venue, Alex was also able to qualify for the Indian Open and International Championship events in the season, while he was also able to reach the last 16 of the first Asian Tour event in Yixing, losing out to the higher ranked Yu Delu. He was also able to end 2013 on a high note, defeating Jimmy Robertson in a deciding frame, to qualify for the venue stages of the Haikou World Open and set up an encounter with four-time world champion John Higgins. Following the turn of the year however, Alex was to win just two further matches, both at the Asian Tour 1 event, meaning that he would finish the season ranked 96th. Alex’s strongest run during the 2014/15 season came at the Shanghai Masters as he defeated Mitchell Mann, Peter Lines and Anthony McGill, before losing 5-2 to Liang Wenbo in the final qualifying round in Barnsley. He struggled in other full-ranking events however and despite a late charge at the Gdynia Open in February, as he looked to secure a fresh two-year tour card from the following season, defeat to Luca Brecel all but confirmed his relegation from the circuit at the end of the season.